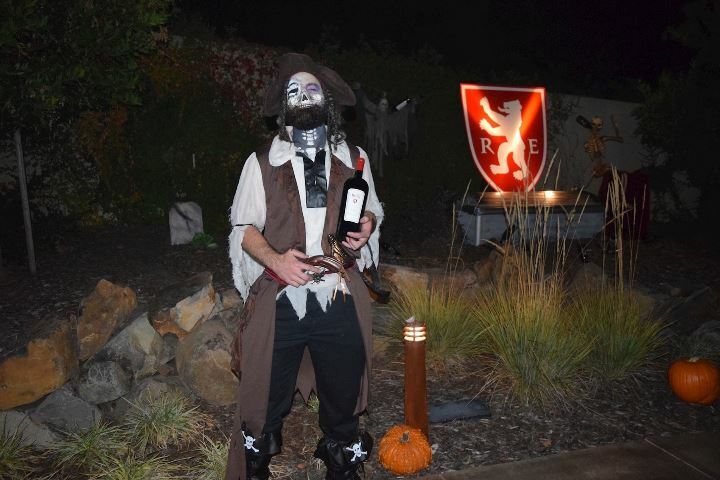 Each year, ghouls, goblins, and wine lovers gather at Roth Estate for their annual Halloween Spook-tacular! This festive event is one of the most highly-anticipated that Roth holds and combines a love for the spooky holiday with Roth’s delicious wines. Guests will enjoy tunes from DJ Dennis Anderson to “raise spirits” and nosh on finger foods to satiate “bloodthirsty hunger” -- all while sipping on Roth wines, of course. The property is transformed into a hair-raising ghostly landscape complete with all of the creepy things that make you sleep with one eye open. Carina “Coco” Sterzenbach, Special Events Coordinator for Foley Family Wines, has helped plan the annual event for two consecutive years -- and since Halloween is her absolute favorite holiday, it’s no surprise that this event is one that she looks forward to year after year. Sterzenbach and the rest of the team at Roth spend countless hours preparing for the big night, considering everything from food pairings and wine offerings to logistics and entertainment. One of the biggest undertakings? Giving Roth’s wine cave a haunted makeover that guests can explore...if they dare. Between the haunts and the treats, the annual costume contest serves as one of the most memorable parts of the event. Roth Estate offers up some incredible prizes for the most creative costumes, and the competition is fierce. The team has seen everything you can imagine, including jellyfish, the zombie versions of Tweedle Dee & Tweedle Dum, game pieces from the classic Clue board game… and that’s just the beginning! Whether you go for a scary monster ensemble, a sweet princess get-up, or a silly unconventional character - get your costumes ready and don’t miss your chance to attend this incredible event! Tickets can be purchased online - $50 per ticket for Roth Wine Club Members and $60 per ticket for general admission & Sister Winery WIne Club members. Enjoy the best of the Foley Food & Wine Society! Receive invitations to events, tours, tastings, special offers on exclusive wines, and access to our partner properties. Great wine goes with great food. Explore our recipe section for great menu ideas to pair with our wines to create amazing flavors to be enjoyed by you and your guests.